For the first time in over thirty years, the Williston Wildcats took on the Avon Old Farms Winged Beavers yesterday in Easthampton. Avon came into Lossone vying to defend their 2017 Large-School New England Championship with hopes for a repeat, or better, an Elite 8 Championship in 2018. Unfortunately for them, their first win had to wait for another day as Williston took the game, 3-2. Williston entered the tilt with some new faces as well as some fan-favorites from last season. The Wildcats are led by their captain, Sam Milnes from Middletown, RI. Milnes is entering his third season at Williston and is looking to build upon a successful 2016-2017 campaign. Other returners include seniors Kyle Caddo (Chester, NJ), Connor Canterbury (Eagle River, AK), Jacob Durocher (Rochester, MA), Billy Smith (Hyde Park, MA), Connor Power (Woburn, MA), Xander Rogers (Anaheim, CA); juniors, Greg Iverson (Brookfield, WI), Kevin Lassman (Parkland, FL), and Tim Rego (Mansfield, MA). Newcomers include post-graduates Logan Geisness (Waukesha, WI), Brandon McGill (Mequon, WI), and Cam Jefferson (Belmont, MA); senior, Cam Ziomek (Southampton, MA); juniors James Belleavoine (Smithfield, RI), Alex Berg (Oldsmar, FL), Cam Mariani (Wilbraham, MA), and Hunter Sarro (North Attleboro, MA); sophomore Ethan Agostoni (Pittsburgh, PA); and freshmen Brandon Barrett (Lake Worth, FL) and David Novotny (Boca Raton, FL). There is also a new face behind the bench for the ‘Cats this season, David Cunningham. Cunningham was a four-year goaltender at Amherst College from 2012-2016, winning the Bob Hanford Memorial Award as MVP during his sophomore year, and last year was a Hitchcock Fellow coaching hockey and baseball for the Mammoths. He currently teaches middle school English. After killing off a highly suspect roughing penalty just ten seconds into the game, Billy Smith got the Wildcats offense going on Williston’s first shot of the game off a pass from James Belleavoine in the slot. Smith let it fly beating all six foot five inches of Avon goaltender Alex Aslandis low between the pads at 2:59 of the period. This appeared to rattle Aslandis who was making his first prep school start, as he took the remainder of the period to settle himself. Later in the period, with two Williston defenders draped all over him, Avon defenseman Mac Wiseman took a pass and beat Xander Rogers for Avon’s first goal knotting the game at one-all at 7:41. The tie was short lived as Cam Mariani let a soft backhander go in the high slot that butterflied over Aslandis left shoulder at 9:22 of the first period. Belleavoine and Connor Power were awarded the assists. Williston would enter the dressing room with a 2-1 lead. Shots for the period were 9-7 in favor of Williston. The second period was all Avon as they tied the score at the 11:25 mark of the frame. The period was inconsistent and lacked flow with penalties marring much of the eighteen minutes. At about the midway point of the period, Williston took a hit to their personnel as Sam Milnes took a skate to the inner thigh and was forced to leave the game. He was taken to Cooley-Dickinson Hospital and left with nine stitches. Avon outshot Williston 11-3. The final period was a flurry of madness as both sides battled hard to gain the lead, but it was the crafty center from Hyde Park who lifted Williston. Smith was able to beat Aslandis once again in front of the net. Cam Jefferson and Kevin Lassman got the helpers. Key blocked shots at the end of the period solidified the win for the Wildcats. Xander Rogers played a flawless third period and ended the game making 25/27 saves. Williston heads to Salisbury on Saturday evening for a tilt against the Scarlet Knights. You may remember that Williston beat Salisbury 6-1 last year and the newly-minted number one ranked club in New England is likely licking its chops for a rematch. See you in Connecticut. After going 1-1 on the road in their past two games, Williston was excited to get reacquainted with the friendly confines of Lossone Arena on Wednesday afternoon as they took on Millbrook in a late afternoon contest. With Xander Rogers back in net once again for Williston, stingy defensive play, and an auspicious overtime, Williston took the first game of the season series, 2-1. Williston began the first period as they have begun recent first periods, getting pucks deep into the offensive zone and not giving up many quality shots early on. Williston was rewarded for their gritty play just 4:12 in when JT Chamberlain collected a puck just below the left dot of the Millbrook zone and let a shot go that was deflected by a Millbrook player and beat junior goalie Greg Brassard on the far side. Assists were awarded to sophomore d, Tim Rego and senior forward, Brendan White. The scoring would end for both teams until third period when Williston was assessed a penalty for hooking. Then, at 13:24, on the power play, Millbrook struck beating Rogers over his shoulder near the left dot to tie the game at 1-1. Both teams would work hard but to no avail and for the third time this season, Williston headed to overtime. In a rarity for the extra frame, Millbrook was assessed two penalties, one for interference and one for hooking. The latter gave Williston the power play for the remainder of the game. With just :17 seconds left, and the puck in their own zone, senior Nick Schofield won the draw on the right dot to Rego who collected the puck and chipped it off the glass and deep into the Millbrook zone. Senior Owen Sylvia raced the Millbrook defender to below the circle where said defender passed the puck up the wall to the hash marks to a waiting Schofield. Schofield gathered the puck and raced to the net with senior JoJo Carbone driving hard for any loose change. With another Millbrook defender committed to Carbone, Schofield cut to the crease and roofed a nifty backhander under the crossbar, ringing the water bottle. A celebration ensued and Williston won, 2-1, improving their record to 8-10. The game was a fairly contested match with only three penalties called all game. Rogers made 18/19 saves to earn the win, while Brassard made 32/34 saves in the loss. Williston takes on the Brunswick Bruins on Saturday at 2:45 at Lossone. Following the game, the Williston girls team will have their annual Pink in the Rink game to raise money for breast cancer. Following the game, kids will be able to skate with the girl’s team. At one o’clock, the annual alumni game will be held so come down early to see all your favorite players from yesteryear, including Coach PJ McCadden ‘10. It will be a busy Saturday at Lossone so please stop by and show your support! On Saturday, the Williston Wildcats took to the road once again, this time heading to Washington, CT to take on the Gunnery Highlanders. Unfortunately, two goals in the third period took down the Cats, 4-2. 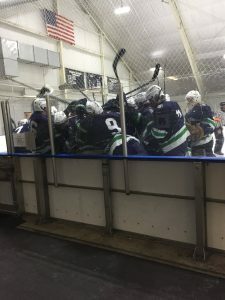 The opening frame began with vengeance as Williston dominated most of the first ten minutes of the game, dumping pucks deep, pounding Gunnery in the defensive zone, and not allowing much, if any, formidable offense for their opponents. But, as it happened, Gunnery was able to take advantage of some sloppy play and went up 1-0 at the 9:02 mark. Williston mounted the offensive train immediately and just :52 seconds later, Williston senior JT Chamberlain netted his fourth goal of the year with assists to Steven Gower and Kyle Caddo. Then, at the 14:43 mark, Connor Power scored his first goal of the season letting a blast go from just inside the blue line that beat Gunnery goalie, Cedrick Andree. Brendan White was credited with the assist. With the period winding down, and Williston feeling like they were going to go to the dressing room up a goal, a Gunnery clear was unable to be corralled by a Williston defenseman at the red line; Gunnery collected the puck and let a shot go with 1 second left that beat Xander Rogers. The first period ended 2-2. The second period saw a barrage of shots from both clubs, but to no avail as both teams went to the break still tied, 2-2. The third period looked as if the pace of the game would remain the same, and it did, until the 5:03 mark when Gunnery’s Matt Danner scored and then just :09 seconds later, Gunnery’s Marc Gatcomb sealed the deal. At this point, Andree buckled down and Williston would pull no closer. The loss was Williston’s tenth on the season and put them three games below .500. The Wildcats take on the Mustangs of Millbrook on Wednesday at 4:45 at Lossone rink. The Mustangs are riding a high this season with key wins and solid goaltending and the game should be a good one. See you there. On Wednesday, the Williston hockey team boarded a coach bus and made tracks to snowy Saxtons River, VT to take on Vermont Academy for a 4:30 tilt. Williston was able to overcome a second period, five-minute major penalty to win convincingly, 6-2. Williston struck early just 1:12 into the first frame when senior Brendan White received a pass from sophomore defenseman Tim Rego on the left wall in the neutral zone. White was able to break wide around a defender and drive hard to the net sliding a puck past Vermont goaltender, Guy Piccolo. Williston maintained nice pressure over the first third of the period, not allowing Vermont to gain any offense. Williston defenders broke up countless plays just inside their blue line, including three or four by junior defenseman Connor Canterbury who led many an odd man rush up the ice. However, the tides would turn momentarily at 7:51 of the first when Tyus Watson-Tummings was able to elude a Williston defender in front of the net and get a stick on a pass from the corner to beat junior goalie Xander Rogers. Both teams would go to their respective locker rooms tied 1-apiece. The second period began with an early goal by Mike D’Ambrosio on a shot from the point, however, the goal was disallowed because of goaltender interference by JT Chamberlain. While the Williston coaching staff reached for their rulebooks on the call, it was to no avail and the game remained knotted, 1-1. Williston would break the tie at the 10:00 minute mark when off a Nick Schofield-face-off win, JoJo Carbone let a howitzer go from the right dot. The shot beat Piccolo over the shoulder giving Williston a 2-1 lead. Williston would earn their second goal of the period on White’s second goal of the game when he drove down the right side of the ice and cut hard to the net beating Piccolo on the doorstep. Assists were given to D’Ambrosio and junior Jake Durocher. The period would end with Williston up 3-1. In the third, Williston continued to roll. At the 1:56 mark, D’Ambrosio at the blue line let go a quick pass to junior Brendan Hansen who was waiting on the doorstep—he made a quick move to his back hand and put it over the leg of Piccolo. White picked up the other assist. At 3:34, Vermont forward Nathan Smith cut the lead to 4-2 but JT Chamberlain put the lead back to three goals with assists going to White and Kevin Lassman. The sixth and final goal for Williston came at the 9:10 mark of the third period. Sophomore and Vermont native Steven Townley scored the first goal of his Williston career in front of his proud parents with assists going to sophomore Tim Rego and junior Connor Power. Xander Rogers earned his third win on the season saving 30 of 32 shots. Williston’s next game is on the road where they face a very tough and seasoned Gunnery team who looks to avenge an early season loss to the Wildcats in December. Game time is at 4:30 in Washington, CT. If you go, dress in layers as their rink is cold. On Friday, January 13th, Williston faced Winchendon at Lossone. The ‘Cats got down early and could never regroup, losing 7-4. The closest margin was when Williston pulled within 1 midway through the second at 4-3. Goals were scored by Kevin Lassman, JoJo Carbone, and Sam Milnes with assists on the evening going to Nick Schofield, Owen Sylvia, Tim Rego, Brendan White and Milnes. Williston gets another crack at Winchendon on February 24th. The next day, Williston traveled to Berkshire to avenge their overtime loss to the Bears the week prior. Unfortunately, it was not to be on this day as Williston lost in a heartbreaker, 4-3. Goals were scored by Nick Schofield, Kevin Lassman, and Steven Gower with assists going to JoJo Carbone, Owen Sylvia, Schofield, Kyle Caddo and JT Chamberlain.